Many experts recommend colonoscopy as a screening method for colon cancer. 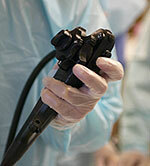 Colonoscopy may detect polyps. One advantage of colonoscopy over other screening techniques is that any polyps found or suspected can be removed during the same procedure as the screening. 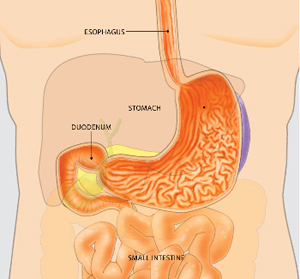 Polyps are benign growths (noncancerous tumors or neoplasms) involving the lining of the bowel. They can occur in several locations in the gastrointestinal tract but are most common in the colon. They vary in size from less than a quarter of an inch to several inches in diameter. They look like small bumps growing from the lining of the bowel and protruding into the lumen (bowel cavity). They sometimes grow on a "stalk" and look like mushrooms. Some polyps can also be flat. Many patients have several polyps scattered in different parts of the colon. Some polyps can contain small areas of cancer, although the vast majority of polyps do not. How common are colon polyps? What causes them? Polyps are very common in adults, who have an increased chance of acquiring them, especially as we get older. While quite rare in 20-year-olds, it's estimated that the average 60-year-old without special risk factors for polyps has a 25 percent chance of having a polyp. We don't know what causes polyps. Some experts believe a high-fat, low-fiber diet can be a predisposition to polyp formation. There may be a genetic risk to develop polyps as well. Colonoscopy, the most accurate way to detect polyps among the available techniques, is almost always done on an outpatient basis and typically takes less than 45 minutes. What are known risks for developing polyps? The biggest risk factor for developing polyps is being older than 50. A family history of colon polyps or colon cancer increases the risk of polyps. Also, patients with a personal history of polyps or colon cancer are at risk of developing new polyps. In addition, there are some rare polyp or cancer syndromes that run in families and increase the risk of polyps occurring at younger ages. Are there different types of polyps? There are two common types: hyperplastic polyp and adenoma. The hyperplastic polyp is typically not at risk for cancer. The adenoma, however, is thought to be the precursor (origin) for almost all colon cancers, although most adenomas never become cancers. Histology (examination of tissue under a microscope) is the best way to differentiate between hyperplastic and adenomatous polyps. Although it's impossible to tell which adenomatous polyps will become cancers, larger polyps are more likely to become cancers and some of the largest ones (those larger than 1 inch) can already contain small areas of cancer. Because your doctor cannot usually be certain of the tissue type by the polyp's appearance, doctors generally recommend removing all polyps found during a colonoscopy. Most polyps cause no symptoms. Larger ones can cause blood in the stool, but even they are usually asymptomatic. Therefore, the best way to detect polyps is by screening individuals with no symptoms. Several other screening techniques are available: testing stool specimens for traces of blood, performing sigmoidoscopy to look into the lower third of the colon or using a radiology test such as a barium enema or CT colonography. If one of these tests finds or suspects polyps, your doctor will generally recommend colonoscopy to remove them. Because colonoscopy is the most accurate way to detect polyps, many experts now recommend colonoscopy as a screening method so that any polyps found or suspected can be removed during the same procedure. Most polyps found during colonoscopy can be completely removed during the procedure. Various removal techniques are available; most involve removing them with a wire loop, biopsy forceps and/or burning the polyp base with an electric current. This is called polyp resection. Because the bowel's lining isn't sensitive to cutting or burning, polyp resection doesn't cause discomfort. Resected polyps are then examined under a microscope by a pathologist to determine the tissue type and to detect any cancer. If a large or unusual looking polyp is removed or left for possible surgical management, the endoscopist may mark the site by injecting small amounts of sterile India ink or carbon black into the bowel wall. This is called endoscopic tattooing. An endoscope is a medical device used by expert physicians to look inside the digestive tract for abnormalities such as polyps. The expert physician controls the movement of the flexible tube using the endoscope handle. What are the risks of polyp removal? Polyp removal (or polypectomy) during colonoscopy is a routine outpatient procedure. Possible complications, which are uncommon, include bleeding from the polypectomy site and perforation (a hole or tear) of the colon. Bleeding from the polypectomy site can be immediate or delayed for several days; persistent bleeding can almost always be stopped by treatment during another colonoscopy.Perforations rarely occur and may require surgery to repair. How often do I need colonoscopy if I have polyps removed? Your doctor will decide when your next colonoscopy is necessary. The timing depends on several factors, including the number and size of polyps removed, the polyps' tissue type and the quality of the colon cleansing for your previous procedure. The quality of cleansing affects your doctor's ability to see the surface of the colon. If the polyps were small and the entire colon was well seen during your colonoscopy, doctors generally recommend a repeat colonoscopy in three to five years. If your repeat colonoscopy doesn't show any indication of polyps, you might not need another procedure for an additional five years. However, if the polyps were large and flat, your doctor might recommend an interval of only months before a repeat colonoscopy to assure complete polyp removal. Your doctor will discuss those options with you.